What is your favorite earring style? At Smoke Tree Jewelers, we know that each individual has a certain preference for the earrings they wear from silver to gold, dangling to studs, and more. We are pleased to not only provide our customers with a wide selection to chose from, but the option to customize any pair of earrings! Our goal at Smoke Tree Jewelers is to provide the best customer service so that they are beyond satisfied. We understand that when you find a pair of earrings you love, but want to change the color of the gems, or would prefer a gold setting rather than silver, we are more than happy to accommodate you! Our friendly experts will help you create the perfect pair of earrings that fit your personal style. Customized earrings are also a wonderful gift, as they are more personalized and special. 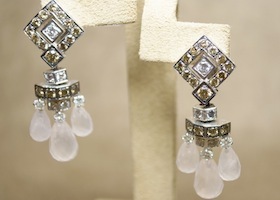 Earrings are always a great go-to gift since you do not need any specific measurements or have to come back for a resize. If you are looking for a special gift that your loved one will treasure, come into Smoke Tree Jewelers today! No matter your earring style, our experts will help you customize the exact earrings you have always wanted and will adore!